^ Blum, Yehuda Z. Russia Takes Over the Soviet Union's Seat at the United Nations (PDF). European Journal of International Law. 1992. 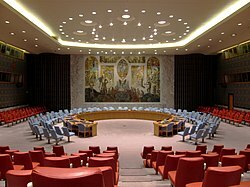 ^ Permanent members of the United Nations Security Council. Wikipedia. 2014.